Prada does things differently. 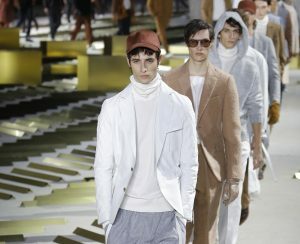 While every other big brand from Gucci to Bottega Veneta in Milan is opting for the co-ed runway, La Miuccia sticks with a men’s show. Even better, while being one of the first labels to introduce the pre-women’s collections on the runway, the house makes a reverse turn here as well and eschews all women’s clothing. Talking about principles and doing things your own way. Before attending the show, Prada invited the press to see Alejandro G. Iñárritu’s brilliant virtual reality show at her Fondazione. 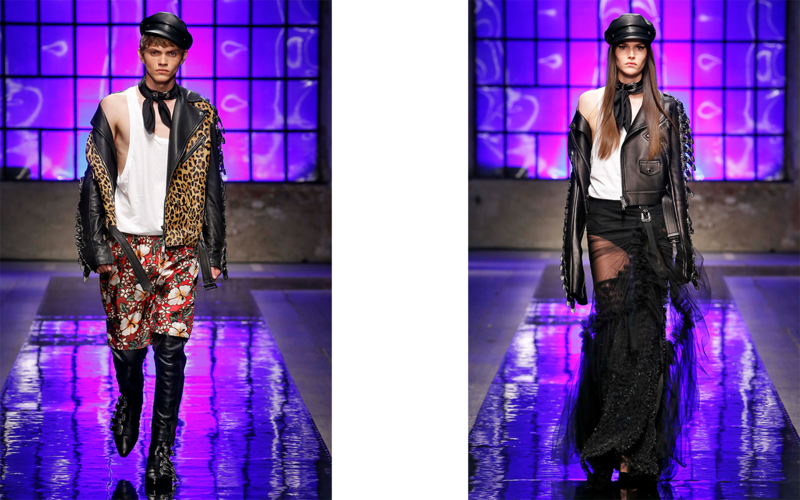 How the Fondazione and the runway communicate? 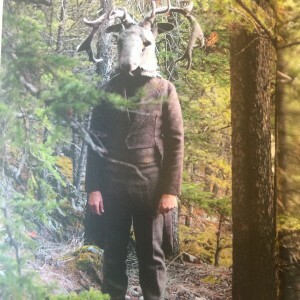 “I wanted the collection to be grounded in reality. Easy, normal clothes. The Fondazione is all about virtual reality at the moment”, mused the designer backstage surrounded by a score of iPhones recording her every word. 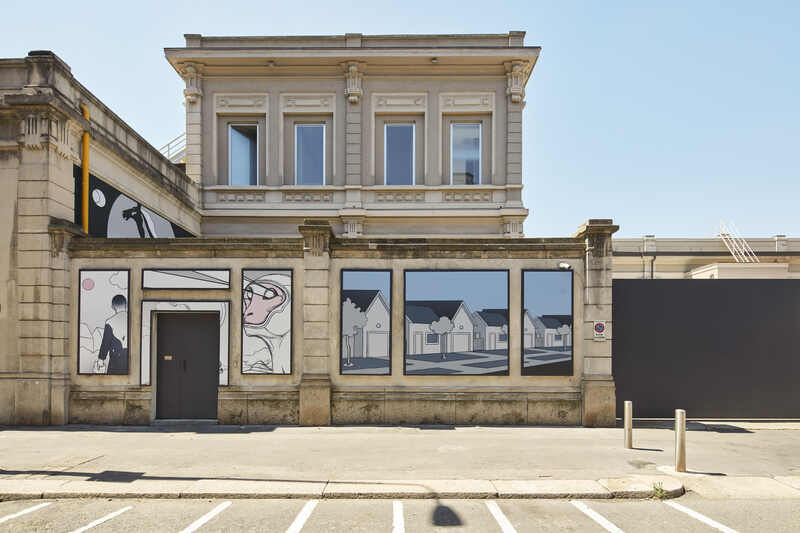 But it’s new: Prada is connecting the dots in her world more and more from Fondazione to collection. The women’s clothes. 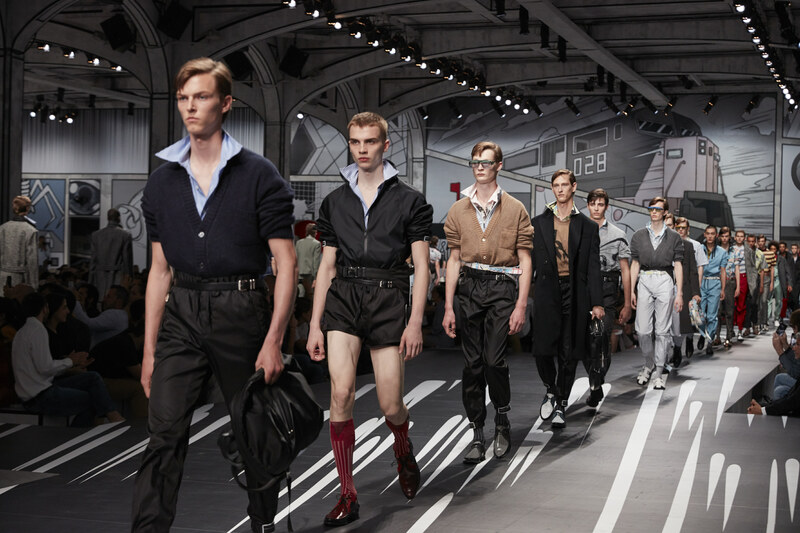 While the show circuit has become a maze of men’s and women’s, pre and post, and whatever other moniker collections, it was refreshing to see the trailblazing Prada not engaging in this habit this season and focus on men’s. 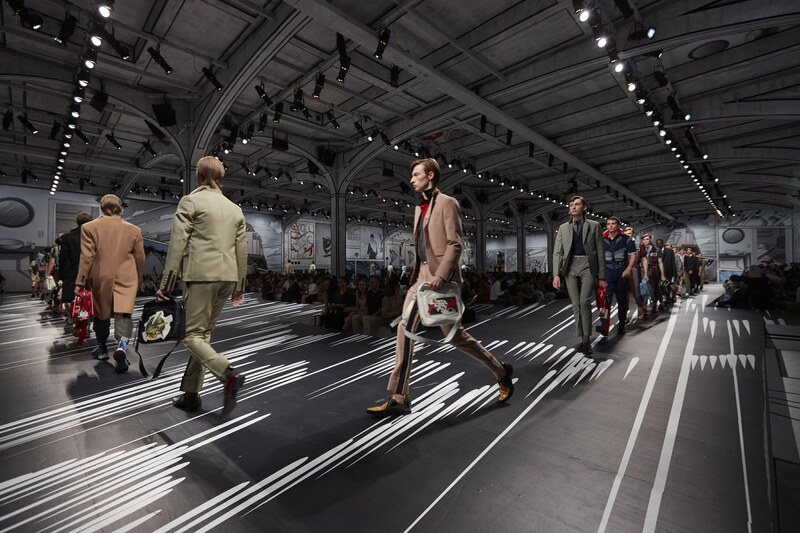 Half the audience of editors is wearing Prada shirts and looks; even the most critical and demanding editors wear their true love on their backs. 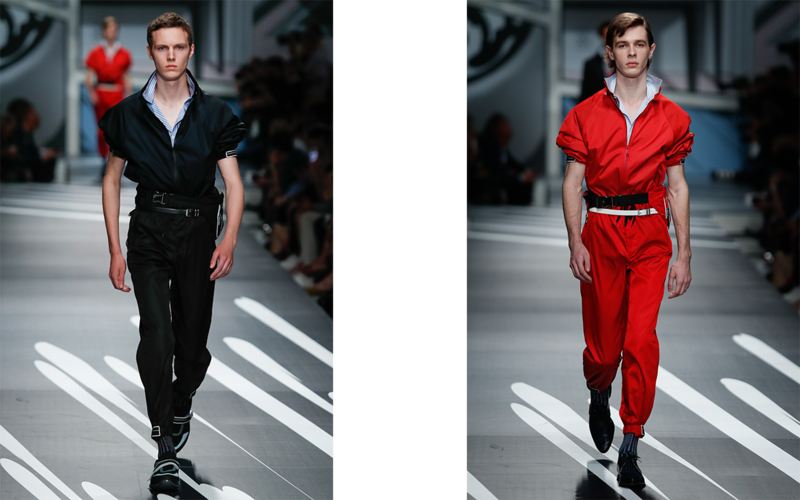 And, when the first two looks are boiler suits in black and red nylon, with collars up. Molto Miuccia. 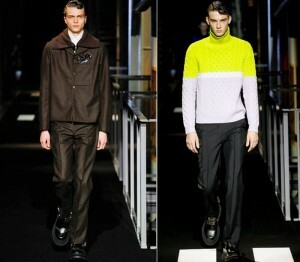 Prada is the best designer and stylist out there, raising the ante with simple tricks like a shirt collar. 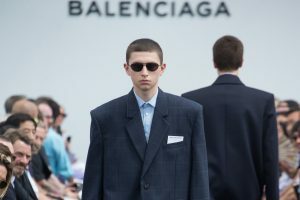 It never gets too tricky on a Prada runway, so the tucked in cardigans and camel coats spoke of the house’s Bourgeois codes. 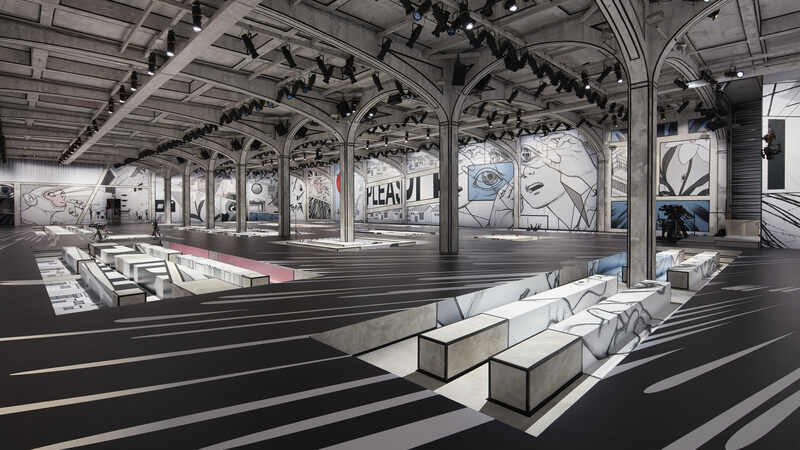 Prada’s new show space with mural paintings like comic strips and graphic novels providing the background for the storytelling of the collection. Things are happening for Dean and Dan. We spotted them last week at Newark Airport taking off for a long distance flight, saw their new impressive corner building shop on Via Sant’ Andrea and Via della Spiga, admired their new ad campaign as we walked into their show space which naturally was shot the same day of the last show backstage. These twins get things done and they surround themselves with the right talent such as show stylist Panos Yiapanis and campaign photographers Inez and Vinoodh. And since they still are party boys at heart, they throw a bash attracting half of Milan’s hipster population right after the show. Sounds stupid but it’s true. Their shows are fun, from the music to the attitude they show when they take their bow. 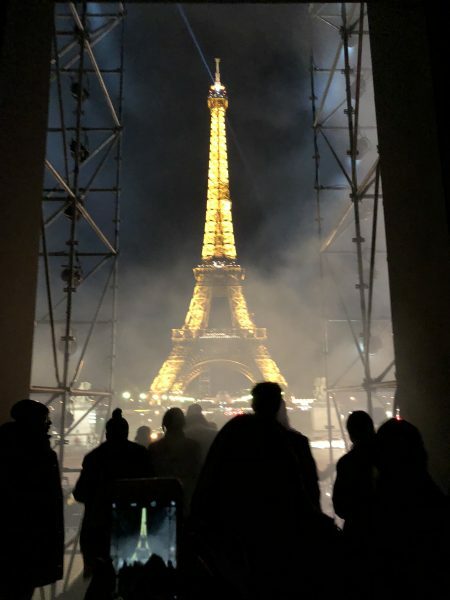 What worked best on the runway? 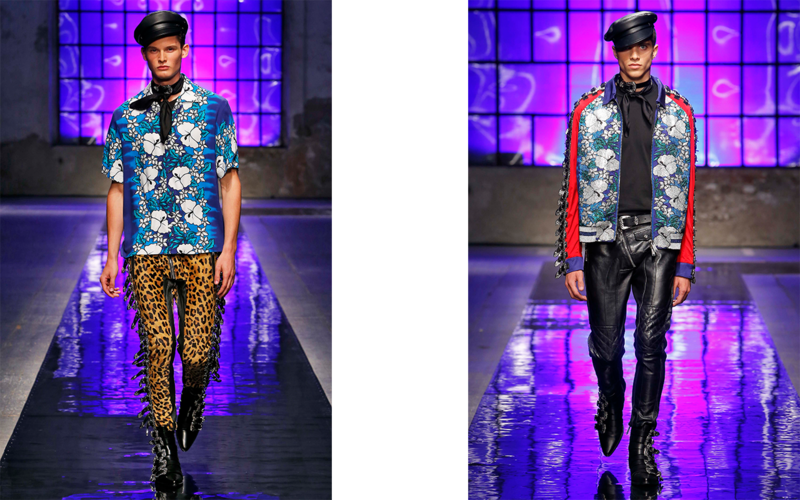 The 50’s vibe with lots of denim and black leather, think James Dean in Rebel Without a Cause was mixed up with Hawaiian floral prints layered over the jackets. It looked new and felt fresh. Their winkle picker boots loaded with Western buckles were over the top and paired with every look a bit too much, but still sooo good. 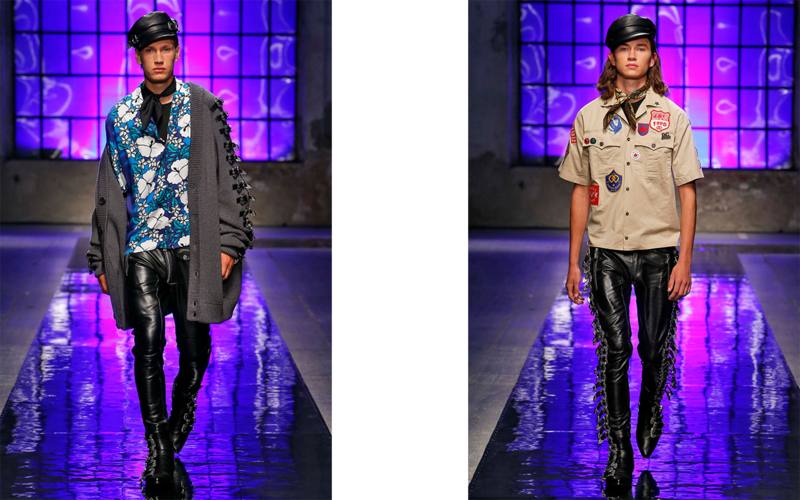 The Western buckle motif was continued on the side seam of pants and sleeves of jackets. The twins flew in New York DJ Honey Dijon for ample acoustics and a New York vibe.